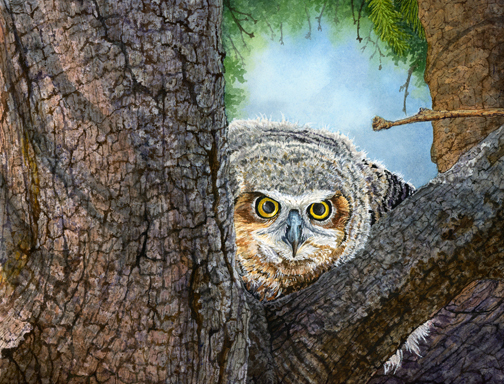 Here is another partial image of a painting for my upcoming exhibit of bird art. I can thank my friend Ron G. for once again providing me with the reference photos of some young Great Horned Owls. I found their bold, staring gaze to be, well…eye catching to say the least! I’m convinced the eyes are following me around the studio and watching my every move! Be sure to sign up for my newsletter so you won’t miss out on seeing the entire painting in the month of April when I’ll “unveil” all my new works for the “Flights of Fancy – Avian Art” exhibit at The Gallery at WREN in Bethlehem, New Hampshire. This entry was posted in Exhibitions, Works In Progress and tagged animal artist, Bethlehem, bird art, Franconia Notch, great horned owl, NH Artist, watercolor art, white mountain artist, WREN gallery. Bookmark the permalink.